The World’s Game Show is back at WinStar and we’re ready to give away $637,500 in cash, prizes and bonus play! 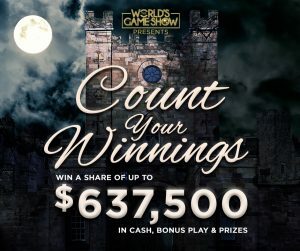 The World’s Game Show promotion happens here just a few times a year, and it is back this month with a spooky “Count Your Winnings” themed installment. If you’re not familiar, it starts like many of our other promotions, but it ends with an extravagant game show in the Global Event Center with amazing prizes. Contestants play game show-style games on stage and compete to win big! Imagine The Price is Right combined with a Vegas-style show. It’s a blast! It is exciting and competitive every time, but this go-around we’ve got better prizes than ever before. We’re giving away three cars valued at approximately $23,000 each, three vehicles valued at $16,000 each and three trips valued at $5,000 each, plus tons of cash and other prizes. If you’re reading this and thinking, “Dang! How can I get myself a piece of that?” keep reading because all the info you need is right here. You’ve only got a few more days to become a qualifier for this Halloween-themed version of The World’s Game Show. Qualifying ends on Saturday, Oct. 22. To qualify, play with your WinStar Club Passport in an electronic gaming machine, and every ten points you earn will result in one entry. Then we’ll be drawing names every hour between 10:00 a.m. and 10:00 p.m. now through Saturday. If your name is called, you’ll receive an invitation to the finale for a chance to compete on stage! The World’s Game Show finale weekend is Oct. 28 – 30, and you will not want to miss this! Even if you don’t win an invitation to participate in the finale, plan on attending one of the three shows during the finale weekend. Come cheer on the participants as they “count their winnings” and join the fun!